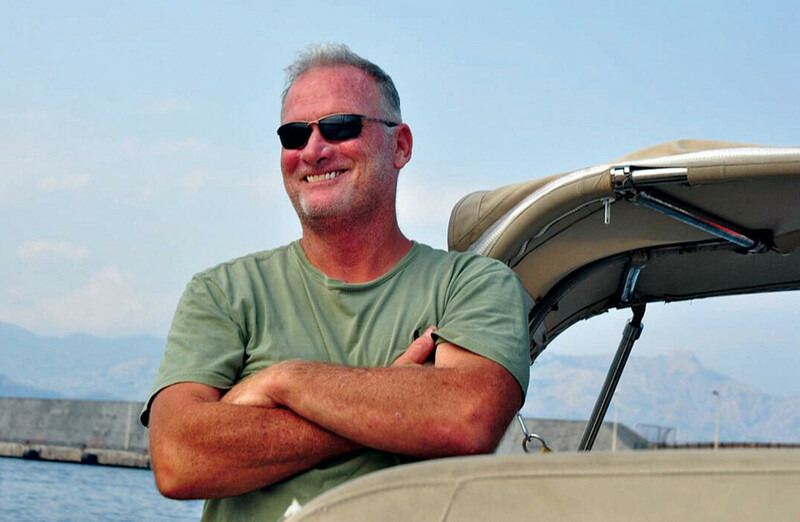 John Kretschmer is a professional sailor and writer who has logged more than 300,000 offshore sailing miles, including 20 transatlantic and two transpacific passages. He is the author of At the Mercy of the Sea, Flirting with Mermaids, and Cape Horn to Starboard, all seagoing classics. He teaches aspiring bluewater voyagers in seminars, lectures and training voyages. In 1984 you set the record for the smallest boat to “double” Cape Horn from east to west in Gigi, a Contessa 32. Is it even possible to describe to modern-day “digital” sailors what that was like? We were so out there. We had no GPS, no sat nav. It was all celestial. Once we were beyond the range of our VHF, we were just out in the world, and it was a weird, wonderful thing. It set the tone for my life, the notion that, hey, you can do great things, but you do them with a caveat. There’s self-reliance at every point. I still believe in that so profoundly. How did that trip even come together?I dropped out of college for the fourth time, didn’t know what the hell to do. The only things I knew were celestial navigation and how to sail. I was anxious and had strong wanderlust. Teaching celestial navigation was just not cutting it for me, so I signed up for the Cape Horn Clipper Ship Race, to sail from New York to San Francisco. I even talked Contessa Yachts into sponsoring me. Then, lo and behold, the race was cancelled. It turns out I was the only on who had signed up.I told Ty Techera about it, one of my celestial students, and he said, “You don’t need a race to do that. Let’s just do it.” I don’t even think he knew what Cape Horn was when he said it, but he was an adventurer in his soul. From that moment on we just pushed on to do it ourselves. Gigi capsized on the first leg out to Bermuda. We were hammered by a wave. We were basically fore reaching but going way too slow. That’s when I started to develop my old notion about heavy weather sailing. You’ve got to keep active and engaged. We just hadt he triple-reefed main up, and we were doing like 2 knots, jogging along. We were taking the waves at about 60 to 70 degrees off the bow.A wave just kind of came out of sequence from the others and popped us really, really violently just aft of the beam. The nose went down, the bow dug in, and we rolled way over. I was thrown out of the boat. I remember being underwater and thinking, “Wow this is really weird,” and then feeling a tremendous jerk on my harness. We didn’t have inflatable PFDs in those days. We just had a regular harness. I was all tangled up in the mainsheet, and when the boat came up it just pulled me right up with it. We’d gone over so hard the stanchions were bent flush to the deck. It’s an interesting thing the perspective on safety today, because if I had had an inflatable harness on, I’m not sure what the result would have been. It certainly would have gone off, but I wonder if I would have been pinned under the boat. I’m always, always thinking about ways to perceive safety on a boat. I’m a strong believer that just buying the gear and sticking it on does not inherently make you safer. You have to be thinking about things. What’s it like to round the Horn? We just kept heading south sort of toward the bottom of the world and figuring Cape Horn would turn up sooner or later. It had been such a struggle. By the time we got to the Horn it felt kind of business-like. I felt incredibly small and humble. I didn’t pump my fists. I didn’t leap into the air. I’m not a spiritual person, but it was a quiet moment. We gazed up at the Horn, and after all the struggles we actually had a reasonable day of rounding it. We took photos and made ourselves a special dinner of canned roast beef and noodles, but it wasn’t as triumphant as you would think. It almost seemed right that way because within 24 hours we just got swallowed up in a massive southern ocean gale on the other side of Chile. I never viewed it as a bucket list. I viewed it as just another place I was going to sail. You once delivered a Gulfstar 50 from Florida to Japan, almost nonstop, for a wad of hundred dollar bills. Why is it that you’ve had such a really good safety record? Luck has come to me, but also I am a conservative sailor, very much so. There’s that old thought, that if a small inkling runs through your brain to reef, you should reef. I generally follow that. I’m able to keep my boat, Quetzal, moving all the time with minimal amount of sail. I don’t have a racing pedigree. I don’t have a racing background. I always notice when I get performance sailors on board how great they sail and how tuned in to every bit of trim they are. My priorities are always different. If I feel in the seat of my pants that something isn’t right, I do not let it lay. I investigate it immediately. If I feel I need to shorten sail or flatten the boat out I do it, even if I lose a knot. I know in the long run that knot is going to come back to me. At what point did you realize you could do these passages on your own boat, as opposed to sailing other people’s boats? I got another lucky break. There was a fellow, Henry, who had a Hylas 49 who gave me the opportunity. He said, “Hey, look. You take my boat. I want it in Antigua in April and in the Chesapeake in August. You have it. Take care of it in the meantime. Do whatever you need to do to make it pay, and we’ll have a deal.” I had this golden opportunity to use a 49 Hylas to set this business up with. It took right off. Sailing Magazine gave me a lot of support. Once the marriage thing completely crashed and burned, I realized that it was just time to get my own boat to do it. That’s how I lucked into finding the Kaufman 47, Quetzal, and the business has been good from day one. You haven’t had any incidences on your own boat, but you’ve had some close calls. How do you handle that fear? It comes back to the way you view the world. I am a weird philosophical stew. I believe that we’re responsible for our own actions in as much as we can be, but at the end of the day stuff’s going to happen, and you just have to accept it. I also think that unless you’re in the cockpit it’s really difficult to judge another sailor’s actions. For example, the captain of the Bounty [which sank in superstorm Sandy] just struck me as a complete idiot with the choices he made with that disaster, and yet I refrain from writing about it because I found myself thinking there had to be something else going on that I don’t know. I have a long discussion with my crew before every passage. Everybody comes aboard, they’re really stoked and excited, and three hours later they’re ready to jump overboard because I’ve gone through all the bad things that could happen and how we’re going to try to cope with them. It took me a long time to have the confidence to do that. I didn’t want to upset people to begin with, but now I upset them as much as I can. I want them to think like a sailor. I don’t want them to stand somewhere without holding on. Thinking like a sailor is what makes you safe. The gear is just an adjunct to that. What motivated you to write your latest book, Sailing a Serious Ocean? I wanted to write a book of sea stories that would be instructional instead of me sitting there like a teacher saying, “Do this, do this, do this.” It was harder than I thought it would be, really. I’m delighted. It’s cool that it’s worked out that way. That was the desire, to write a book of stories like that. I think it gives you more credibility. Some self-deprecation is also really good. The notion that you’re the expert getting everything right, that’s tiresome I think.